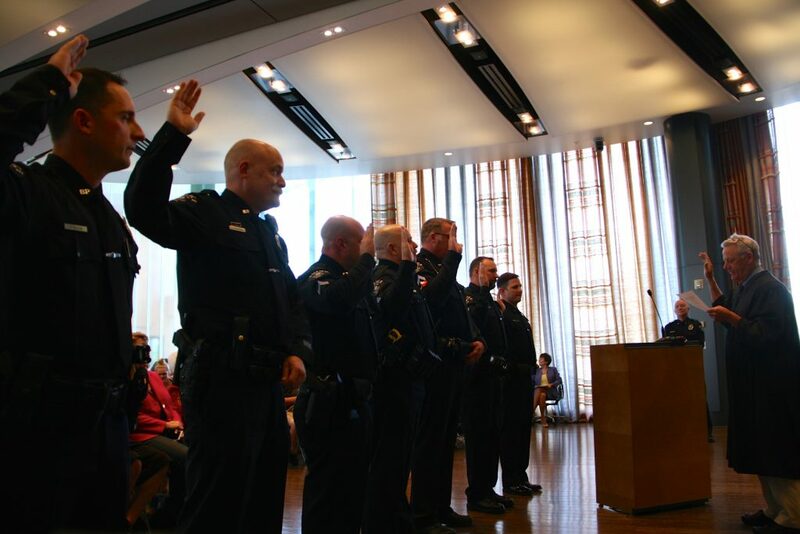 The Bremerton Police Department is adding a new rank — corporal — in between officer and sergeant. Seven men were promoted to that position Wednesday: Aaron Elton Tim Garrity; Steven Polonsky; Todd Byers, James D. Miller; Dahle Roessel and Rodney Rauback. Next time you get stopped by a Bremerton police officer, take note of those stripes you see on his or her sleeve. OK, so that might not be the first thing on your mind if you’re being pulled over. But the sleeve can tell you a lot about an officer’s rank. In Bremerton, it’s becoming a bit more nuanced. An officer who makes the rank of sergeant has three blue “stripes” on the arm (see photo below). But here in the city, you’ll soon see seven officers who have two stripes (see photo above). Those seven are the department’s first corporals, a position that is roughly between an officer and a sergeant. The Kitsap County Sheriff’s Office actually did away with the position years ago but Bremerton is bringing them back. The reason, Bremerton Police Chief Steve Strachan explained at Wednesday’s City Council meeting, was born out of a top-to-bottom review of the police department completed three years ago. That review found flaws in the former “MPO” or “Master Patrol Officer” program, whose participants could cover for sergeants to run the shift. The review also found that not many officers were looking to get into management roles, Strachan said Wednesday. Strachan is hopeful the new rank not only introduces the seven corporals to leadership roles but that it it inspires them to go even higher. These will be the leaders of the department long after folks like me are gone,” Strachan told the Council. The department is also bringing back a third lieutenant position — the next step up from a sergeant — which had been the victim of budget cuts a few years ago. There’s a lot of open positions right now in the police department. Lt. Pete Fisher left to be chief of the Fife Police Department, so they’ll have to fill two lieutenant spots. And the city held a retirement ceremony Wednesday for Randy Olson, a longtime sergeant and officer who’d been with the city since 1988. “Part of me will always be a Bremerton police officer,” Olson told the Council. 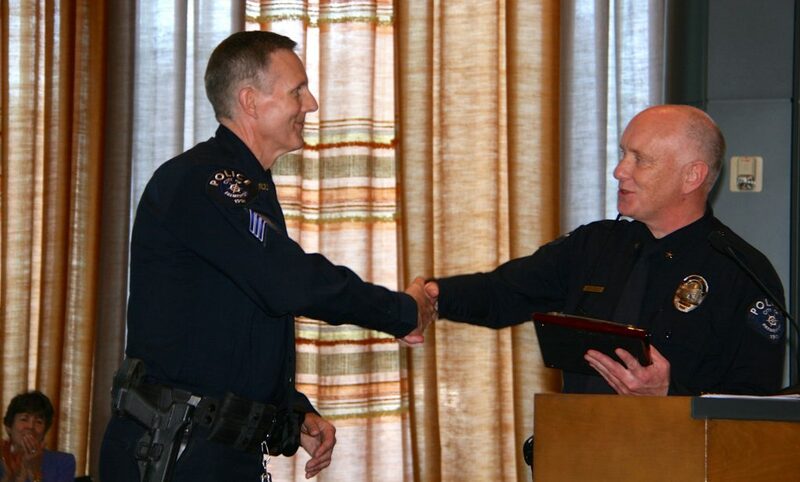 Sergeant Randy Olson (left) is congratulated by Bremerton Police Chief Steve Strachan. Note Olson’s three stripes. This Police Chief seems to really have it together. I heard him speak at the KCC story walk. I appreciate his coming to that and I got the feeling that he is a genuine and good guy. As most of us who are paying attention already know, not all guys who refer to themselves as a “Good Guy” are good guys. In management considerations and in principle this is an excellent measure he has taken. Recognizing that a more defined rank structure may be of crucial benefit in the face of an emergency response on any scale, and best for public safety at the same time. A little fraternization parameter wouldn’t hurt either. Case in point, Poulsbo City scandal. Between that one and the teleporting drunken Sargent, Poulsbo is putting self on the map by choice. The situation should be handled before a nickname like “PoliceBo” takes hold. Why the head in the sand?